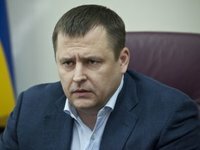 Dnipro Mayor Borys Filatov has appealed to the leaders of law enforcement agencies with a request to provide him with personal security. "Dear Arsen Avakov [Minister of Internal Affairs of Ukraine Arsen Avakov] and Yuriy Lutsenko [Prosecutor General Yuriy Lutsenko], please provide me with personal security team," Filatov wrote on his Facebook page, arguing his request that he fears an attempt. According to the mayor of Dnipro, there were two cars with Kyiv license plates near his house and "strange looking people were walking there" on Thursday. "... I have a heightened sense of danger and I am responsible for hundreds of good people. And I experienced three assassination attempts on the part of separatists and personal threats from the deceased Zakharchenko [leader of 'DPR' Alexander Zakharchenko]," Filatov said. At the same time, he put forward two versions: either a provocation on the part of the "law enforcement authorities," or a preparation for the attempt. The mayor of Dnipro also assured that he would not go anywhere.